Via Mobility Services (formerly Special Transit) was founded in 1979 to provide transportation for older adults and others with limited mobility. Today, it is a multi-county, multi-program organization that provides transportation and mobility options in 19 communities in five counties in Colorado. Rose Community Foundation’s first grant to Via Mobility was in 1997 when it was still Special Transit. Its collaboration with Rose Community Foundation over many years helped establish a model and infrastructure for transportation services that are as vital today as they were fifteen years ago. According to Lenna Kottke, Via’s executive director, Rose Community Foundation’s longstanding partnership with the organization has been critical to both its essential backbone services of door-through-door transportation, and its capacity to innovate and think ahead about how its offerings need to evolve. Kottke says the Foundation was “one of the first organizations to recognize the importance of mobility for older adults” as a way to preserve their independence and keep them connected to their community. In 2000, the Foundation funded and convened a Transportation Summit to bring people and agencies together to discuss ways to support those in need of transportation assistance. “So many good things came out of that summit,” exclaims Kottke. The summit was the nexus of important regional partnerships like the Denver Regional Mobility and Access Council and the Getting There Collaborative. These regional collaboration groups serve transportation needs by increasing, enhancing, sharing and coordinating regional transportation services and resources. “Rose Community Foundation was really ahead of the curve,” Kottke remarks. One of the other important services Via provides in an ever-changing transportation landscape is “travel training.” This training teaches individuals and groups how to use public transit, including planning routes and anticipating obstacles. 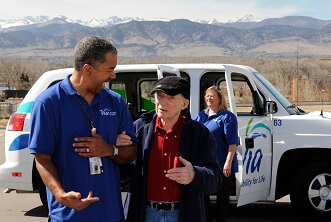 Rose Community Foundation saw the benefit of encouraging older adults to use public transit before any such program existed in the Denver metro area, and provided funding to Via for a pilot travel training program. Since then, the program has grown significantly and now trains more than 180 individuals each year. Via’s travel training program has been nationally recognized as a best practice for communities around the country. Other communities and organizations have replicated the model that Via developed. Kottke says Via works hard to serve current needs, while actively anticipating how people will want and need to travel in the future. In recent years, the organization has converted their fleet of vehicles from larger vans to smaller, more fuel efficient vehicles. Via also works to stay abreast of new options and services like Uber and Lyft and is developing a volunteer driver program, once again with seed money from Rose Community Foundation.